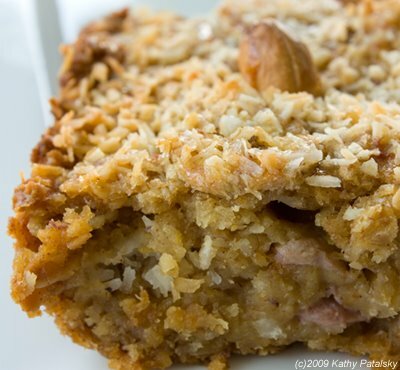 I plan to make these Oatmeal Bake Tiki Squares to take with us when we go out of town. Served with fruit, they will make a great breakfast treat or snack. I cannot remember where I got this recipe, but it was off the internet. I made slight modifications to it because my family is not a big fan of coconut. I hope they are good! 3 Tbsp Cashews, a few banana slices and 1 Tbsp maple syrup. 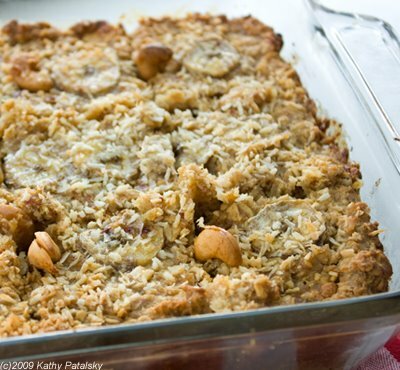 Combine these ingredients in a large bowl: toasted rolled oats, flaxseed meal, baking powder, salt, cinnamon. Stir in milk, maple syrup, agave syrup, vanilla, coconut oil, applesauce and almond butter. Fold in cashews and bananas. Pour mixture into a greased casserole pan. Top with a few banana slices and dot with cashews. Bake at 350 for 40 minutes or until the center of the bake is firm. Top should be browned. Allow to cool for a half hour. Cut into large squares. Serve with fresh fruit. Try macadamia nuts and dried papaya.